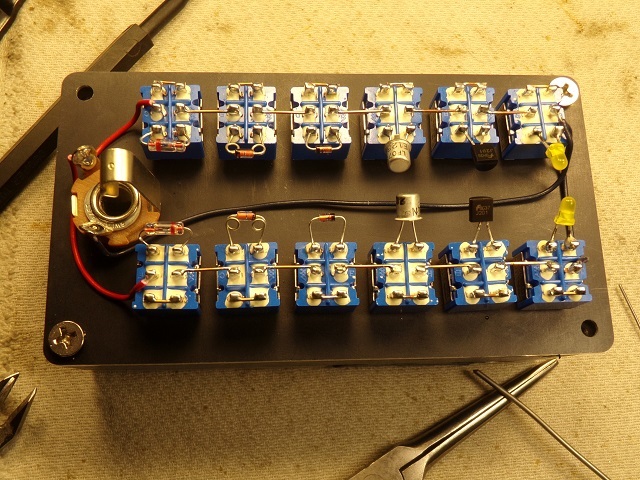 MUFF WIGGLER :: View topic - Oakely Overdrive II - different clipping diodes. Oakely Overdrive II - different clipping diodes. Hey there all. Has anyone tried replacing the clipping diodes in the ODII? Best I can tell it's using 1N4148 silicon diode (914s) as clippers. 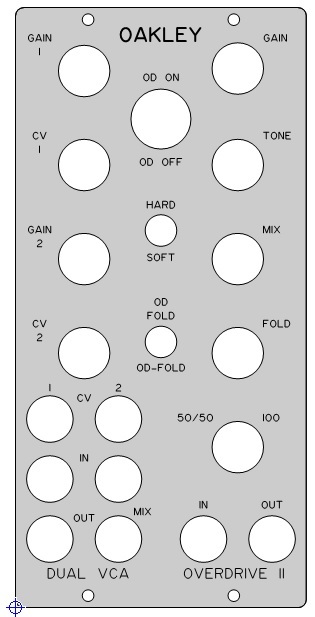 I've been considering adding a companion panel (or simply expanding the 1sp panel to a 2sp panel) to accommodate a selection matrix of different clippers. I know from past experience that different clippers create vastly different types of distortion, mainly in the gain vs distortion ratio. Here's one I do as an expander for certain stompboxes that use the same overdrive circuit that the ODII uses (I have not purchased one of the ODIIs yet so I have not seen the schematic, but it seems to me to be similar to the basic "Distortion Plus" or "250" type of circuit .... not the Tube Screamer which is a totally different circuit). So if I'm on the right track here, the clippers simply short to ground just before the output volume pot and are not in the feedback loop of the opamp. So anyhow, I was wondering if anyone had tried using different clippers in the ODII. And if so, what were the results seen? I didn't try using any other diodes in that part of the circuit so I too would be interested in hearing about other diodes being used. I have played around with different diodes in Tubescreamer type circuits but although they made noticeable differences with a guitar I found with monophonic synth work that they made only a small difference. The intermodulation products are going to be far less with simple input waveforms and I think the differences in the diodes only really show themselves when you have more complex signals to work with - like playing multiple notes or chords, easily done on a guitar of course. The ODII has both tubescreamer and diode clipping circuits, the one you hear being dependant on the 'distortion/overdrive' switch position. Essentially there are two diode networks one in the feedback pathway of a non-inverting amp, and the other on the output. A dual gang switch simply selects which network is engaged. The clipping circuit in the Fourmix module is similar in principle to the distortion section of the ODII. Although this uses a more complex network of zener diodes to achieve a very smooth soft clipping effect. Thank you for the reply, Tony. My 5U modular is normalized in a 4vco/2 voice architecture (switching jacks provide means to defeat the norm'd connections, much like the ARP 2600). It can be set up in a duophonic configuration (using features of the Kenton Pro 2000 MkII) which permit playing two note intervals. It's also got a ring modulator network, one ring mod on each of the two voices. There's a third component, that being a digital voice which has a lot of harmonic content. Voices, ring mods, digital voice ... these are all optional aspects, of course. I can obviously trim it all down (with just the flick of a toggle switch or two) to a single VCO if desired. Nothing is locked in permanently ... I figure you get the point by now. To illustrate what's going on, I drafted this block diagram to help visualize the signal paths and how they work with one another. Point being, there can be a lot of harmonic content available if I want it, which will give the ODII something to "bite" in to. In that configuration different diodes may actually be of use. Of course, some trials (and errors) will be needed before anything conclusive can be arrived at. 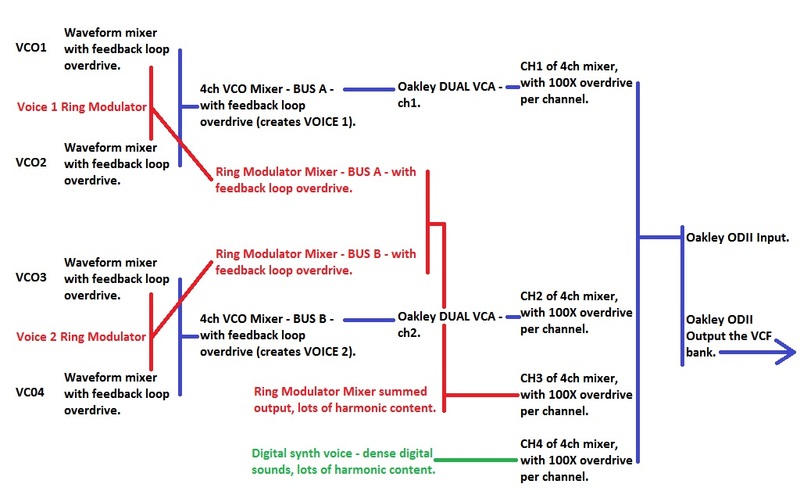 There are 7 mixers used between VCO output and ODII input, all of which have the ability to overdrive/distort their input signals on a per-channel basis ("7" includes the ring modulator mixers). So there are plenty of places within the pathway to add harmonic content before the signal enters the ODII. I'm frothing at the mouth as I work through completion of the synth, there is a lot to work with and I'm excited to get started creating sounds with it. The Dual VCA and the ODII will be pivotal circuits in this beasty. Perhaps what I've detailed out will be of help to see what I'm working with. I messed up that diagram. Per the suggested use on the Oakley website, I'll be placing the ODII after the filter bank. I've already designed a Front Panel Express file to place the Dual VCA andthe ODII on the same MU sized panel (2 spaces wide). Both the Dual VCA and the ODII will reside in the signal chain after the filter array.